What are they deciding about you? There is a formula for sounding confident, compelling and captivating and I’d like to share it with you. Just sign up below and you’ll receive the free training videos each day that will get you on your way to sounding more confident, captivating the audience and compelling them to take the action you want! Your voice is the most powerful tool you have if you know how to use it. I’ve seen over the last 28 years that many who struggle with their voice are analytical, sometimes perfectionist and maybe introverted. This method is perfect if that’s you! It’s a highly technical approach to voice but will take you to a place of freedom you’ve never known before. Sounding confident is easier than you think, you just need to know what voice techniques to apply, apply them and change the product coming out of your mouth. It’s faster than you think! Are you an actor who gets to the call backstage but rarely books the job? A writer who pitches but doesn’t land the gig? An entrepreneur who knows exactly what to say on a podcast, but your clients aren’t engaging? Are you a CEO who’s employees have all the right tools at their disposal but still aren’t making bank? Then I’ve got to tell you, it’s most likely because of the voice. It’s an unusual concept, but an important one. Especially in an age where everything online or on film/TV is about viewership, exposure and getting your message across in an efficient, accessible, user-friendly way. I was a television actor for many years and have over 25 years experience in the vocal coaching of CEOs, Entrepreneurs, and Celebrities from all around the world. I want to help you sound more confident. To help you captivate your audience and engage your desired response. I want to facilitate you taking the next step in your journey to living the fullest, happiest, most successful life possible. To do that I need you to breathe, and be open to understanding the power of finding your true voice. Second only to body language, the voice our most effective way of reading people; either connecting with them or finding something off about them that we can’t quite put our finger on. It’s not about what we say, it’s about how we say it. Some people’s voice falls flat. Some can’t breathe to connect to the voice. Some sound forced or unnatural. Some say “um…” A LOT. Some get so nervous being on camera that they just rush through like a freight train, hoping the nightmare will end, and they can return to the safety that exists on the other side of the camera. The subconscious mind of your viewer picks up on all of that. The power is yours. Be your best self. Captivate the room. If you want to sound more confident, create more connections, and compel people to take action like BUY from you then grab my FREE video training, the Voice Formula. Hi! 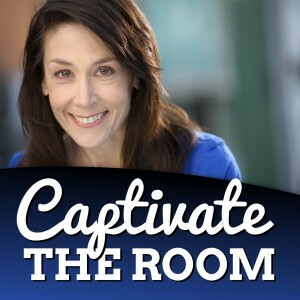 I’m Tracy Goodwin, international voice expert and author of the book Captivate the Room. I help passionate business leaders and entrepreneurs (like you!) transform your speaking voice so you can make a bigger impact, sound more confident and step into your power to influence others with your voice. You need to change the psychology of your voice. I can help you with that. I get to the core of the problem which started when you were a little child. The sub-conscious mind took in information and if it was negative (or even not) it went to work to protect your voice, the most vulnerable tool you have and the orchestra of your heart. The sub-conscious mind laid your voice into the muscle memory and the way you speak today is a result of it. The biggest issues for business leaders and TV actors, speakers and entrepreneurs are voice barriers. Voice barriers are the things we hear in your voice that keep us from connecting with you. If you want our business you have to connect with us. Just by listening to your voice I can tell you what is getting in your way, your barriers and keeping you from connecting with others and catapulting your success. I want to help you discover what is getting in your way of sounding and feeling confident when you speak, to help you with the simple techniques that will set you apart, help you deliver your message in a confident, captivating and compelling way. Your voice has the power to touch people’s emotions and bring your message to life. Your voice can attract your audience and make them instantly engage with you. Your voice can get you what you want. Freedom. Impact. Intensity. But over time, you pick up bad habits that keep you from stepping into the full power of your voice. (3) not using vocal variety for fear of what people will think or other reasons. Presentation matters and the voice is the missing link. If you are ready to sound more confident, captivating and compelling, to build stronger connections and catapult your personal and business success then you need to have a voice that makes people listen. Get my FREE video training, the Voice Formula today.